From the archives of The New York Times, 165 years of the most notorious real-life crimes. For 166 years, The New York Times has been a rich source of information about crime, its reporters racing alongside tabloids to track the shocking incidents that disrupt daily life. 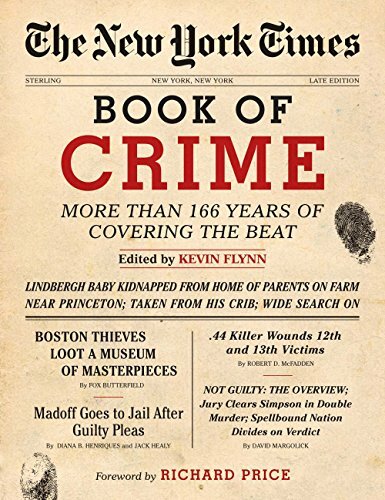 This fascinating compilation, edited by seasoned Times crime-beat veteran Kevin Flynn, captures the full sweep of the newspaper’s coverage of the subject—from the assassinations of icons like Lincoln, John F. Kennedy, and Malcolm X to the deadly trails left behind by serial killers like H. H. Holmes (America’s first recognized serial killer), the Son of Sam, and Jeffrey Dahmer. This comprehensive review examines issues like incarceration, organized crime, and vice—from the Attica riot to the powerful Medellin Cartel—as well as the infamous crimes that riveted the world. The kidnappings of Jaycee Dugard and the Lindbergh baby. The Manson murders. The robberies that exasperated law enforcement, from bank heists by Dillinger to the enduring mystery of the greatest art heist in American history at Boston’s Isabella Stewart Gardner Museum. White-collar crimes from Ponzi to Madoff. Crimes of passion, such as Harry Thaw’s dramatic shooting of Stanford White, his rival for the charms of the beautiful Evelyn Nesbit. Chapters are organized by topic and include explanatory material by Flynn to provide context. The book features more than 70 photographs as well as reproductions of front-page stories. Although the focus is on the US, important international stories are included.